Bill Reynolds has announced the release of PCLinuxOS 2013.10, the latest round of maintenance updates for the project's "KDE", "MiniMe" and "LXDE" editions: "PCLinuxOS KDE 2013.10 (32/64-bit) is now available for download. With respect to the previous KDE editions these ISO images have the following changes/additions: Linux kernel 3.4.64. KDE 2013.10 has all the additions from MiniME and was built to provide a general-purpose KDE desktop computing environment. The DVD includes popular tools for office, audio, video, graphics, and Internet applications (LibreOffice 4.1.2, GIMP, Skype, Dropbox, VirtualBox, etc.) as well as additional drivers and tools to set up your hardware (graphic card, network, printer, scanner, etc.)." Read the release announcement (the "LXDE" edition was announced in a separate post) for more information and screenshots. Download links: pclinuxos64-kde-2013.10.iso (1,575MB, MD5), pclinuxos64-kde-minime-2013.10.iso (631MB, MD5), pclinuxos64-lxde-2013.10.iso (698MB, MD5). 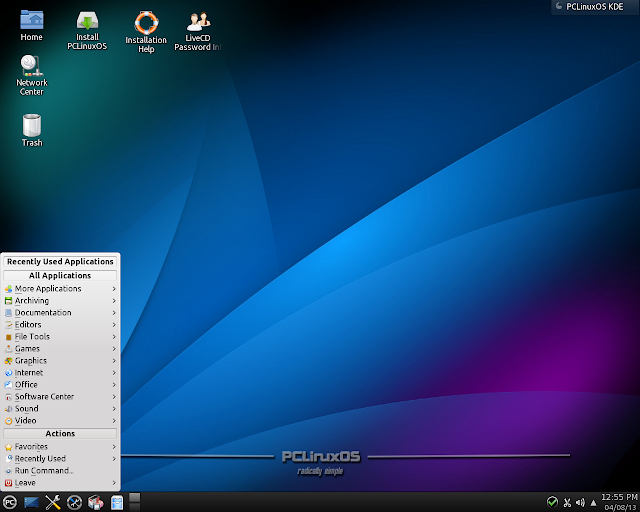 PCLinuxOS is a user-friendly Linux distribution with out-of-the-box support for many popular graphics and sound cards, as well as other peripheral devices. The bootable live CD provides an easy-to-use graphical installer and the distribution sports a wide range of popular applications for the typical desktop user, including browser plugins and full multimedia playback. The intuitive system configuration tools include Synaptic for package management, Addlocale to add support to many languages, Getopenoffice to install the latest OpenOffice.org, and Mylivecd to create a customised live CD.